Two numbers came to my attention in the last five days and it is hard to decide which one is MORE disturbing. The first one is $9 and the second one is $750,000.00. I was incredulous over the week-end when I learned that an EMT working for Rockford/Lowell Ambulance makes $9.00 an hour. With a 40 hour week that would be $18,720 a year assuming you worked 52 weeks with no vacation. Ambulance transport costs hundreds of dollars. Rockford Ambulance is registered as a non-profit and a Google search told me they had 4.64 million in annual revenue. When we had a coffee shop in Lowell, we paid $8.50 to $9.50 an hour to part time workers who knew how to make coffee. It does take a couple of hours of training to learn to pull a great shot of espresso, but attending Baker College to get certified as an EMT takes about six months and will cost $6,600.00 for the courses and books. One of the current trends that just bugs the crap out of me has to do with the pretense that what happens in location A really does not have any effect on those of us in location B-Z. Or that somehow we can build a wall or withdraw from our neighbors in order to "protect ourselves" from THEM. As the Great Philosopher once said, "Them is Us." On a global scale, the fact that the Olympics are being held in a Zika hotzone, to say nothing of the conditions of the waters down there, scares the crap out of me. People from all over the globe are traveling to Rio and then they go back home. "Who cares about the mosquitoes in South America?" That kinda thinking had traction when folks walked and rode horses - today not so much. 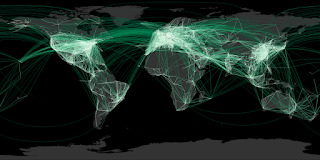 Here is a cute little graphic with some airline routes to make my point.